The new 3 Series has just been unveiled, that the break point is already the end of his tailgate. While the sedan has just been unveiled at the Mondial de Paris, the first images of the new station-wagon BMW 3 Series have already been leaked well before its official presentation prior to the summer of 2019. Even if some impatient such as the designer X-Tomi has already drawn their own version, the variant Touring derived from the seventh generation of the BMW 3 Seriesshould not be marketed until the fall of 2019. 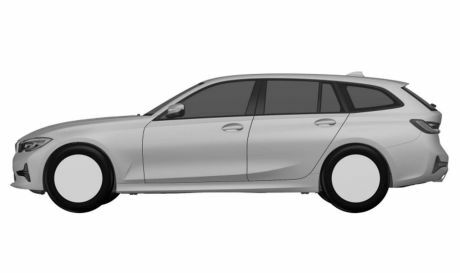 Yet, today we can discover a first rendering of the new station wagon, bavarian, thanks to the leak of images from the national Institute of industrial property of Brazil. Don’t you think that there is something wrong at the level of the rear quarter panel ? They then discovered a break which takes naturally the same aesthetic codes as the sedan, with a front identical. On the rear part, in spite of the addition of the tailgate, the optics remain very similar to those found on the trunk of the sedan, taking a form very horizontal. Side template, the break should logically have the same growth as the sedan, with a length range 4.71 m instead 4.63 above. The weight will be, however, in decline, thanks in particular to the bonnet and front wings in aluminium (- 55 kg over the sedan). The engines will be also carried over from the sedan and will be mostly under the hood of this break of the four-cylinder petrol and diesel engines. A variant plug-in hybrid as well as an M Performance-equipped with a six-cylinder engine will still be available in the future. The new 3 Series Touring will be presented before the summer of 2019.